…there was a beautiful lot and a small forest. we were fortunate to find our perfect lot as it had yet to go on the market. one of our builders was in the process of buying it and we were lucky enough to be his first customer. the lot had been owned for by a japanese family, however it had lain dormant save for a small run down cottage located at the back for many year. the family estate had only recently released it for sale. 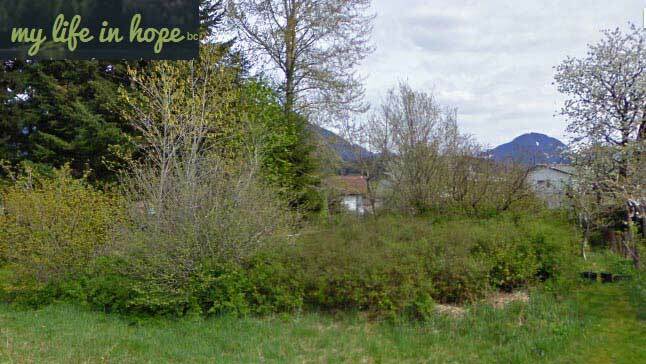 the lot was covered with undergrowth and had a lush verdant look about it, particularly when seen next to the small coniferous forest immediately adjacent on the north side of the lot. though above the flood plain, we were told the soil was rich sedimentary deposit from an earlier time. our neighbour on the south side of the lot are an old italian couple who have planted their yard with fruit trees, grape vines and a large vegetable garden. this is complemented with a small greenhouse and a chicken coup with 3 or 4 birds and an old dog who is anything but mean, contrary to the warning signs posted on the gate. we first saw the lot on october 15, 2011. we moved into our new home february 28, 2012!